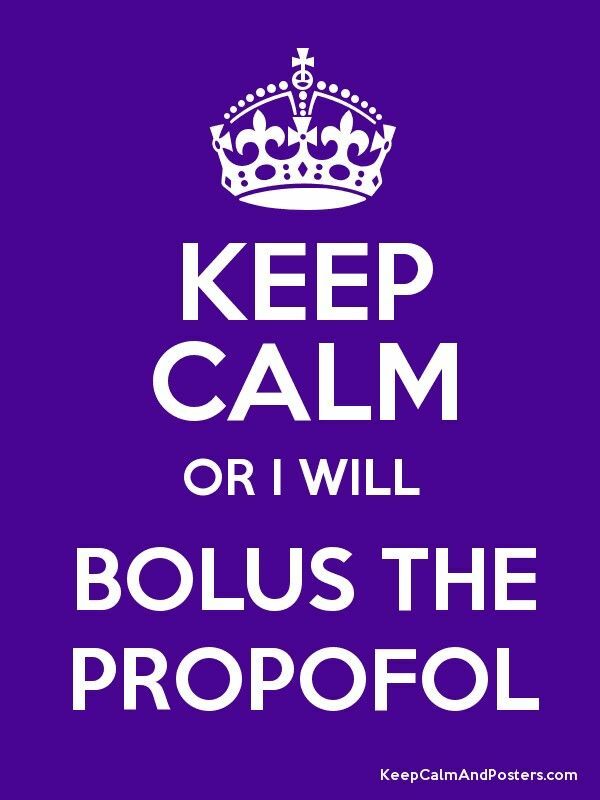 Propofol is a very commonly used drug in the veterinary world. We use it to help patients fall asleep before surgery. My last rotation of the year was spent in the anesthesia department at the university hospital. This was a rotation that my whole group wished had been scheduled earlier in the year. We were taught lots of valuable information about drugs that would have been very helpful during our placements–but better late than never! The anesthesia department at the hospital runs almost all of the anesthetic protocols for any procedure going on in the hospital–so this means cats, dogs, horses, and occasionally other fun animals! An anesthetic protocol is required for any patient that needs to be asleep for a procedure– like taking an x-ray or having a surgery done. Each student was required to be ‘primary’ on a case for the day and read their patient’s file and then develop an anesthetic plan that would appropriately match the patient’s diseases and procedure. This is complicated. Especially when your patient has multiple diseases and you can’t give them certain drugs. Jessica reading up on her patient’s medical history. There is a TV in our student lounge connected to one of the surgical suites. On this day, I sat & ate my lunch and watched a thoracotomy. After doing a physical exam on our patients, creating an anesthetic protocol, and preparing all our equipment and machines we would draw up our drugs into syringes. The first step is then administering a pre-medication drug to the patient to make them a little sleepy. After that we would collect our patient from the wards, bring them to the prep room and place an IV catheter in their vein. We also placed an endotracheal tube (so we can control their breathing), and finished prepping them for their surgery or procedure. During surgery we monitor the patient’s vital signs to make sure their heart is beating properly, they are breathing correctly, and other important things. Once the surgery is finished we are in charge of making sure the patient wakes up smoothly and safely. During some of the afternoons we had tutorials where we learned about different stages of the anesthetic protocols and could ask any questions we needed to. We all had to take complete charge of a patient (with no help from supervisors and nurses) and we were assessed to make sure we could do everything appropriately and safely. My patient was in hospital for a toe amputation. Everything went smoothly! Some of the patients that I created anesthetic protocols and monitored for were getting CT scans, MRIs, spays, foreign body removal surgeries, etc. Unfortunately, this post can’t be too much longer without talking about a lot of fancy drug names and anesthetic equipment. I found it helpful to practice using new drugs and talk about protocols with the experts! At the end of the 2 weeks…we were done! But actually, DONE! No more rotations 🙂 next step…. graduation! Last day of DVM4! We are in the prep-room in front of some of the anesthetic machines we had been using during our rotation. This entry was tagged anesthesia, hospital, learning, rotation, uni. Bookmark the permalink.